WOW! A lot has happened since my first P-Day, so I will try my best to not leave anything out. It was a tough week but it has been filled with the spirit! Time flies when you are working hard and having fun. So since my last update, my district has had the opportunity to go to the Mexico City Temple twice! The first time was right after emailing last Wednesday and we got to go again this morning. It is gorgeous and insanely big! It looks like a really cool Mayan temple, both on the inside and out. I could feel comfort of the Holy Ghost throughout the temple. We did the sessions with headphones to translate to English but occasionally I would take one ear out to try to pick up some words in Spanish and it was such an awesome experience! Me and mi compañero have been getting a little better with Spanish, but we still have a lot to improve on. We set a goal to read 7 verses each of the Book of Mormon in Spanish before we go to bed and it has helped not just with the language but with having the spirit with us. I am beginning to listen and understand Spanish better, but I still am working on building my vocabulary. However, I am excited to see some improvement! As a district, we have had 3 days of solamente español. Although we have struggled with it, it has been a great learning experience. We just got new zone leaders on Sunday and they challenged us to have a Spanish only day on our P day which is today, and it has been really hard! But we have had fun with it and I have made some decent progress in speaking español. Our district has gotten so much closer this week! It has been pretty hard for some of us because we have had two elders have to go home this week. So because of that we had two companionship changes. Between our close friends leaving and struggles with the language, our district has grown a lot closer to each other and we have had such a blast these past few days! It has been a busy week but I have definitely felt the comfort of the spirit and all of your support! Sunday was an incredible and inspiring Sabbath Day. During Sacrament meeting, the spirit was strong and a district leaving to the mission field sang a musical number of "Para Siempre Dios Este Con Voz" and that was super amazing. I have grown to love that song and also other hymns in spanish. Afterwards, President Call and his wife had a devotional and they told some amazing stories of some missionaries when they were Mission Presidents of a city in Mexico (sorry I forgot the name). I felt super excited for the chance I soon have to see the gospel change lives of so many people and their families! We also got the chance to watched a devotional video from 2011 given by apostle David A. Bednar. He talked about the steps to becoming a "Preach my Gospel" Missionary, and how to be an effective servant of the Lord. It was really inspiring and the spirit was strong! Afterwards, I got to say goodbye and wish Elder Williams good luck as he left for his mission in Arizona. And we got a picture with Elder Johnson to represent the Centennial Ward, whooo!! This week I have met a lot more people and we have made some good friends with some other districts. On Monday and Tuesday we played volleyball against two other districts and that was a blast! We also played ultimate Frisbee with a few other elders on Friday. I also was introduced to an Elder who brought a harmonica and we had a pretty great jam sesh together haha! Yesterday was also a great day because the Relief Society President of the church, Bonnie L. Oscarson, came to visit the CCM and gave a really awesome devo. Me and my companion also participated in the musical number choir and we sang the EFY Medley song in Spanish and that was really cool. Hermana Oscarson talked about how our mission calls are truly inspired from our Heavenly Father, he knows us and has planned a specific mission experience for each of us in order to help us grow and prepare for the rest of our lives. She mentioned my mission scripture, Alma 26:12, "Yea, I know I am nothing; as to my strength I am weak; therefore I will not boast of myself, but I will boast of my God for in his strength I can do all things; yea, behold, many mighty miracles we have wrought in this land, for which we will praise his name forever." I love this scripture so much! 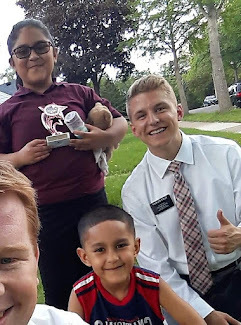 Serving a mission will be a really challenging experience, especially having to learn Spanish. But I testify that our Heavenly Father has prepared a way for us to overcome all of our adversities. Sister Oscarson showed the Mormon message of the gardener and the current bush. It is one of my favorites because it talks about how in order to grow and produce fruit we need to be cut down and pruned by the gardener. God gives us trials in our lives for a specific reason, to help us learn and grow and become more like him, and I love the quote "Heavenly Father loves us enough to cut us down". Also, a connection from the devotional given by David A. Bednar is that as missionaries, we are not the true teacher, it is the power of the Holy Ghost that testifies of the truthfulness of the restored gospel of Jesus Christ. Only through the witness of the Holy Ghost can people become converted to the gospel. I have received a witness from the Holy Ghost that the Church of Jesus Christ of Latter-day Saints has the true restored gospel on the Earth today. I know the truthfulness of the Book of Mormon and feel enlightened by the Spirit every time I read it. I testify that through sincere prayer, by the power of the Holy Ghost we can know the truth of all things. I cannot wait for the moment I place my first Book of Mormon and share my testimony and the happiness I have found in my life through the gospel of Jesus Christ! Also, feel free to send me letters! I would love to get more letters from all of you, the mailing address is down below.